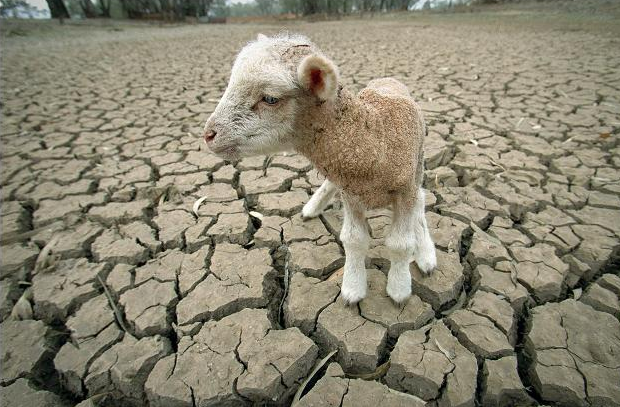 The entire state of NSW is now impacted by drought, official figures show. A drier-than-expected June and July have left many farmers with failing crops, a short supply of water and diminishing livestock feed. According to the NSW Department of Primary Industries, 61% of NSW is either in drought or intense drought, while nearly 39% is drought affected. "This is tough," the NSW primary industries minister, Niall Blair, said in a statement on Wednesday. 'There isn't a person in the state that isn't hoping to see some rain for our farmers and regional communities." Less than 10mm of rain was recorded in the western, north-west, and central areas of NSW over the past month and drier-than-normal conditions are forecast for the next three months across the majority of the state. "Producers are now faced with some very difficult decisions on whether to graze sown crops or rely on potential rainfall in the next two months in order to increase yield production," Blair said. Previously a small area of the state's north coast was yet to be declared drought affected. On Tuesday, the deputy prime minister, Michael McCormack, urged farmers to put their hands up for drought relief payments even if they were reluctant to do so. Almost 20,000 people are yet to apply for the federal government's $190m drought relief package, which has been attacked as "too little, too late" by critics. "There are many, many farmers who at the moment haven't actually made themselves available of the assistance that is there for them, and we urge and encourage them to do just that," McCormack told ABC radio on Tuesday. "I think everyone agrees that we're seeing rainfall that is if you like, more erratic, droughts that are more frequent and seasons that are hotter," he told the ABC. He reaffirmed Australia's commitment to reducing carbon emissions after the former deputy prime minister Barnaby Joyce said the government's actions would do nothing to stop droughts. Joyce, whose NSW electorate of New England has been badly affected by drought, believes reducing emissions in Australia won't change the climate. "Any policy we do, it's more of a sense of a commitment to a wider purpose," he told Sky News. "It will have no difference on the climate whatsoever - zero, zip, nothing." But the National Farmers' Federation president, Fiona Simson, pointed to a 45% reduction in red meat industry emissions between 2005 and 2015. Simson said Australia needed to understand the effects of climate change to continue as a world leader. "The impacts of climate change will mean that [drought and rain] events could be more extreme but they could be more frequent," she said. Farmers have meanwhile expressed concerns the media is too heavily focused on drought "disaster" stories, fearing it could damage the reputation of Australia's livestock industry. Their concerns have been echoed by Blair, who is worried attention on farmers shooting animals or leaving them to starve will undermine Australia's standing as a meat-producing nation. or drought affected, while 23% is experiencing intense drought.